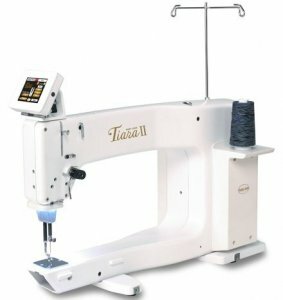 As the first home sewing company to bring you longarm quilting, Baby Lock is proud to introduce the Tiara II. Take your first step into the Baby Lock royal longarm family with this 16″ sit-down machine. This smooth operating, user-friendly machine comes with its own table so you’ll be ready to quilt right away. Plus, its compact design uses little sewing room space! Quilt at a speed comfortable to you, up to 1,500 stitches per minute, and watch as bright, natural colored LED lights illuminate your workspace. Finish your quilts with Baby Lock royalty – the Baby Lock Tiara II. For the love of sewing. With 16 inches to the right of the needle and 8.25 inches high, the Tiara gives ample room to finish quilts of all sizes. Long-lasting, high-intensity LED lights illuminate your workspace so you can see every detail on your quilt. Access your hardware and software options, lighting options, stitch counters and more through the large LCD touch screen. When using the optional TruStitch™ Stitch Regulator, a quick touch is all it takes to adjust from stitch regulator and manual modes. The Tiara comes with its own smooth quilting table so you have everything you need to start quilting. Set your preferred height to ensure a comfortable quilting position. Enjoy less bobbin changes with the largest bobbins available in quilting (up to 40% larger than a standard bobbin). Plus, with variable speeds on the electric bobbin winder, you can easily wind thread of different types and weights. Enjoy free-motion quilting at a comfortable pace with the TruStitch™ Stitch Regulator. The automated regulator helps you achieve evenly spaced, consistent stitches every time. Plus, while in use, you still have full view of your quilt—TruStitch™ remains out of the way. This easy-to-use stitch regulator is helpful for quilters of all skill levels. Use the Table Overlay to prevent fabric from sticking during free-motion quilting. Pair the Table Overlay with the TruStitch Stitch Regulator to glide your fabric through consistent, even stitching. Use the Horizontal Spool Pin to reduce the risk of twists and tangles when using delicate, decorative threads. The Horizontal Spool Pin is ideal for specialty threads wound on a spool (not a cone). Enjoy less bobbin changes when you use large “M” class bobbins. With this pack of three, you can have multiple thread colors ready to go! Copyright © 2007-2019 - The Sewing Machine Shop, Inc.